This is another film I watched over the holiday. It was hard to watch, yet I didn’t want to switch it off. It’s not about the music and scenes of the Velvet Underground or glamorized tales of Andy Warhol and his inner circle. The film, released in 2018, dramatizes the sobering, heartbreaking life of this 1960s icon, as she lived her final years in the late 1980s, while beginning in earnest to lay the groundwork for a brighter future. There is no inspiration here, but something else makes it worth watching. It is a story of a real life, well dramatized with cooperation from her son, and based on witness accounts from her inner circle. I buy the 42 oz. carton of quick oats; currently $2.39 at Aldi. That works out to 45 servings at 5.3 cents each. The packages of seeds and bran store neatly in a basket in the back of my frig. Shake the jar until the ingredients are mixed. I keep an old broken teaspoon in the mix jar, and an orphaned 1/3 measuring cup in the oatmeal canister. I use a large soup bowl so it doesn’t boil over in the microwave. Stir and let cool for a few minutes; then eat. I eat this oatmeal every. single. morning. It’s a small breakfast, so around mid morning, I usually need a ‘second breakfast’ of toast or an egg; or I eat a very early lunch. Buying all of the ingredients at once may seem pricey; especially if you aren’t sure you’ll like it. So my suggestion is to buy one item each trip to the store, and start using that item in your oatmeal. Start with oat bran, then wheat bran, then chia seeds, then flax seed. Flax seed can be purchased as whole seeds, and then ground in a coffee mill for the mix. Cinnamon definitely changes the taste. I suggest trying it in one bowl before making a whole batch of mix with cinnamon. I’m used to the taste, and I like that it ‘might’ have anti-inflammatory benefits. I’m not sure the sugar is necessary. I don’t need my oatmeal to be sweet. I plan to make my next batch of mix without the sugar and see if I like it. For an extra jolt of flavor and nutrients, try tossing a few craisins, raisins or other dried fruit pieces into the bowl before putting it in the microwave. When I say I eat this every morning, I mean every morning. If I’m going on a trip, I pack my own individual oatmeal packets; one for each morning I’ll be away. Usually I pack some powdered milk too, so I can make breakfast with hot water, in case that’s all I’ll have access to. Milk — Essential for bone density; helps with blood pressure, metabolic syndrome and weight management. “There’s some evidence it [flax seed] may help reduce your risk of heart disease, cancer, stroke, and diabetes. That’s quite a tall order for a tiny seed that’s been around for centuries. Just for fun, here is what has happened with some of the things I wrote about over the last year. Our historic ballpark is gone. The entrance to our 84-year old ballpark looked like this in September, when they announced it would be torn down. They first tore the grandstand down. Here is the site in November, when only the box office and entry gate remained. Now those are gone too, and it’s a big flat dirt field. In 2020, we are supposed to have a new ballpark in its place. I finished reading “Sticky Fingers”. After my blog post about the book, it took a couple of renewals from the public library, but eventually I finished the book. It is a well written book about a repulsive character. It was a repulsive read to the end. It made me want all of those hours back that I’d spent over the years reading Rolling Stone magazine. The soiling of Page 393. As I was pushing on to finish the book, a bad thing happened. I took the book with me to the movie theater to read while waiting for the movie to start. I bought a little bag of popcorn. Too late, I realized the bag was leaking butter. I soiled the library book on possibly the most important page, and maybe the only important page of the entire book. When I returned it to the library, I confessed and showed them the page. I’m waiting to find out if they are going to bill me for the book. They certainly are within their rights to ask me to pay for it. Because I was up front with them, and the stain was confined to a couple of pages (it bled through to the next page), they will not ask me to pay for a replacement book. Lesson learned! Have I mentioned how much I ❤ our library? Well, this is just the latest reason. The electric blanket needs another repair already. Thanks to the foster pup, aka “Jaws”. The pepper plant is still growing. 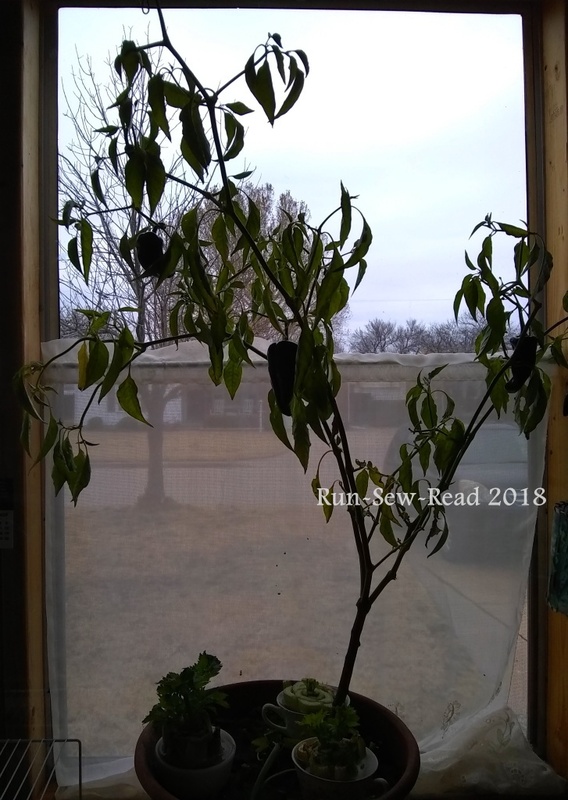 The Poblano pepper plant that I’d planted and tended outdoors all summer, is now in a pot on the enclosed porch in the south sun. It gets cold on the porch but has stayed above freezing. When the sun is shining, the room can get above 70°. 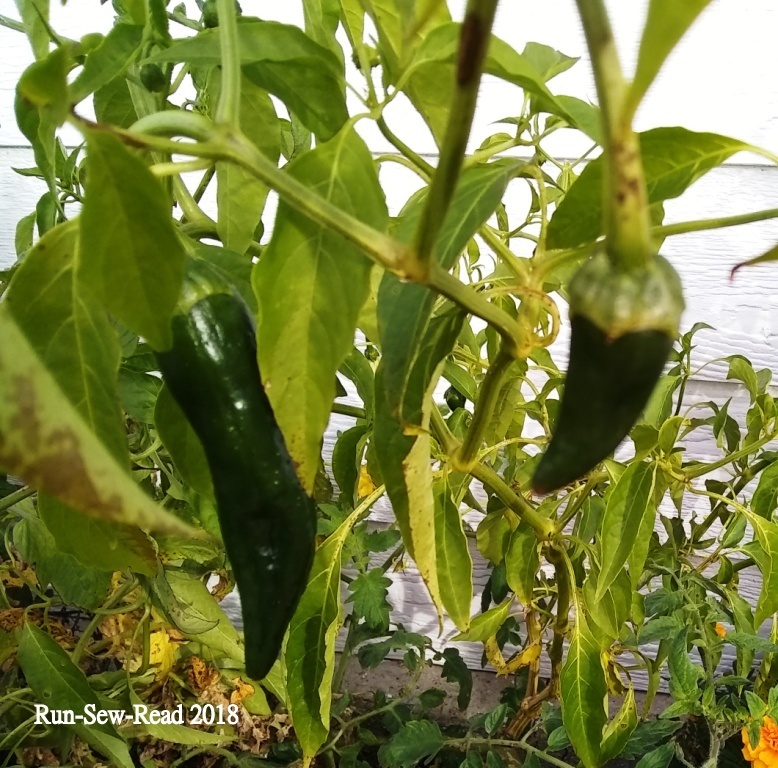 Three peppers are growing on the plant, albeit very slowly. I may be waiting all winter for a harvest of three peppers. Another Coco dress is in the works. Here are numbers 1 and 2. Aaand another holiday season is in the books. One of my favorite holiday songs goes from reflective to angry to a call for hopefulness. It sums up the end of the holiday season the way I feel it–looking back on the joyous gatherings of family and friends, and looking forward to the new year. If you loved the original Mary Poppins movie like I did, then Mary Poppins Returns is a must-see. It is not a remake of the 1964 movie. It is a continuation of the story, 20 years later. The music and actors are different from the original, but it feels completely connected. I got emotional several times during the movie, not because it was sad (it isn’t), but because it was wonderful to have more of the Mary Poppins story. Put the two movies together, and it’s a captivating miniseries. and the familiar Cherry Tree Lane. Mary’s carpet bag, blue striped coat and striped skirt. Jane Banks/Emily Mortimer’s pants-vest outfit. The pants in particular. They are pleated and baggy, and the hem hits where the ankle meets the foot. If you are a Mary Poppins movie fan, and haven’t seen Mary Poppins Returns yet, I hope you can get to see it at the theatre. Until then, here’s a little reminder from 1964. You wouldn’t know it now, but these jeans were once Casual Friday office attire. Then they morphed into my go-to comfortable yard work and housework jeans. Then a knee blew out. Then the other knee went. With two holey knees they were stylish, so heck yes, I kept wearing them. Now they’ve reached the point where the denim is falling apart in places. I don’t need to keep the jeans, but they are darn comfortable. So, I started using them to experiment with patchwork. A dig through my stash ensued. Flowers from this barkcloth print now cover the knee holes. Some chambray strips from old curtains, are now a woven patch to reinforce the worst weak spot in the denim. It’s working well. For the next fix, I want to mask the stained sides, where I’ve wiped my hands way too many times. I’ve removed a pocket, which shows what color the fabric used to be. I’ll put the pocket back on, but maybe not in the same spot. My mom used these iron-on patches on my brother’s jeans all the time when we were little. They didn’t last that long on little boys’ jeans. The patch edges would start lifting, and then the patches could be peeled off. I might find a way to use these on my jeans. The patchwork will be a continuous work in progress. There are more places to repair now or soon, and as I wear the jeans, they will keep developing new areas to be patched. Hopefully the jeans will keep looking better as I add to them, so that someday they warrant showing in another post. Not a blue jeans song, because this creative process is about thinking outside the lines and beyond the obvious. More sewing inspiration this week came by way of this hour-long documentary on photographer Slim Aarons. What caught my eye first, were the colorful ‘everyday’ dresses and the lighting. Slim’s former assistants were interviewed in the documentary. They were lovely and poised, and told good stories. “We’re waiting for clouds.” I’ll remember that one. In listening to his assistants tell about the photos, I fell in love with the fact that minimal makeup and staging was involved. The subjects were mostly rich, privileged, and often famous, but the settings relaxed and the smiles were natural. The documentary only lasts an hour, but that was just the start for me. After the documentary, I spent an absurd amount of time perusing the Getty photos website, where Slim’s archive is available for viewing and prints for purchase. Slim had a repeat theme of hammocks, and furry boots. I love both. Slim would have celebrated his 100th birthday in October 2016. That month, Getty released this 1-minute video of 100 of his images.